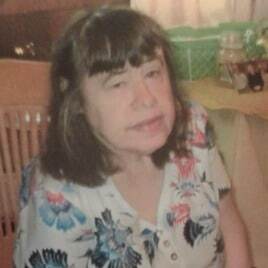 Ms. Mary Martha Lewis, 62 years old, entered into eternal rest with our Lord on Tuesday July 25th, 2017, at St. Vincent Medical Center in Bridgeport, CT. Mary was the daughter of the late Burton R and Anna Fox Lewis of Southbury, and niece of the late Uncle Bill Fox of Oxford. Mary was a former resident of Oxford and Southbury, and a former communicant of St. Thomas The Apostle Church in Oxford Mary worked at Kennedy Center for many years (around 20 years), and enjoyed going to work. In her pastime, she took care of her favorite birds, and had a passion for music and anything colored blue- especially cars. She leaves her cousin Roxanne Fox of Oxford, best friend Phyllis Burr of Danbury, her aunt, Mrs. Roseanne Fox, cousins: Craig Fox and daughters, Joan Fox and family, Sandy Davis. As well as a special friend, Mel Turner of Oxford, along with her family, friends, and staff at Clasp Home in Stratford. The Burial (if interested), will be held at Riverside Cemetery in Oxford, CT on Thursday, August 3, 2017 at noon (12 pm). This is on the corner of Freeman and Coppermine Road. Any donations made will be given towards Cancer research or to the Clasp Home. Healgrief has a memorial to share with you. https://healgrief.org/mary-martha-lewis/ We invite you to express condolences, share special memories and photos and light virtual candles to honor and celebrate the life of our loved one. We also invite you to share this with others who may want to be notified as well. You may do so by sharing the link or by clicking the “Share this Memorial” button from within the memorial itself.